FOR IMMEDIATE RELEASE—MAY 2, 2012– Binghamton, New York–SunMaxx Solar, a leading integrated manufacturer of solar thermal systems and components is pleased to announce that the SRCC (Solar Rating Certification Corporation) has completed testing of the company’s new and improved SunMaxx ThermoPower brand private labeled collectors which have received a re-certification on the VHP10, VHP20 and VHP30 models. 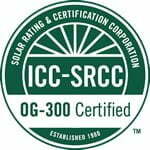 In April, 2012 the SRCC found the enhanced VHP30 collector to be the most efficient on the market, which earned the VHP30 the highest rating in the solar industry, outperforming competitors Apricus, Kingspan, NTS, and Solar Power Plus. The SRCC re-certification for SunMaxx Solar collectors continues to ensure that the systems qualify for incentives and rebates, which can help customers to pay some of the initial cost of a solar hot water system. Other benefits include achieving the highest thermal efficiency and good thermal stability. SunMaxx is a leader in renewable energy manufacturing and distribution, offering many SRCC certified system options in the U.S. and abroad.